KML AL is an app that seeks to encourage individuals to "Know Your Status, Manage Your Health, and Live Your Best Life." It is an information source that seeks to help prevent the transmission of HIV/AIDS and to help those with HIV/AIDS in managing their disease. 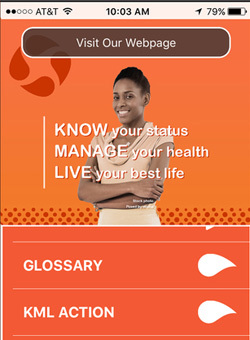 The app gives information on how HIV is transmitted, how to prevent HIV, how to get tested for HIV, and how to manage the disease. It's available now from iTunes and Google Play. The ADAP and Part B Services Annual Report 2018 is now available. This report reflects the clients actively enrolled in ADAP as of December 31, 2018, and clients receiving Part B core medical and support services during 2018. ADAP and Part B services clients achieve optimal health outcomes at a higher rate than all persons living with HIV in Alabama, with the majority of ADAP and Part B services clients already surpassing or approaching the National HIV/AIDS Strategy (NHAS) 2020 indicators of 90 percent retention in HIV medical care and 80 percent viral suppression. The Start Talking Alabama campaign seeks to increase HIV awareness and decrease the stigma by sharing prevention, testing, and treatment information, and support. The CDC's new Every Dose Every Day app is designed to help providers support medication adherence among people living with HIV. Medication adherence improves health outcomes and increases the prevention benefits of treatment. Visit the CDC to learn more about the app. This report is now available online. The Finalized 2017 HIV Continuum of Care depicts persons living with HIV (PLWH) in Alabama who are engaged in selected stages of HIV treatment. Successful HIV Prevention and Care programs exhibit high linkage to care among newly diagnosed clients, as well as effective retention in care and adequate viral load suppression among existing HIV-positive clients. As viral load is considered a measure of infectivity, maintaining a suppressed viral load decreases the likelihood of infecting another person and is the focus of Treatment as Prevention strategies. PLWH who adhere to antiretroviral treatment and maintain suppressed viral loads can reduce the risk of sexual transmission of HIV by 96 percent. For PLWH who reach undetectable levels, there are no documented cases of sexual transmission. This is the premise of the Prevention Access Campaign's Undetectable Equals Unstransmittable (U=U) initiative, which the Centers for Disease Control and Prevention supports, agreeing there is "effectively no risk" of sexually transmitting HIV when on treatment and undetectable. The Preliminary 2018 HIV Continuum of Care is also available. Note that 2018 data should be interpreted with extreme caution as not all reported cases have been investigated and entered into the HIV Surveillance database. 2018 data will be finalized December 31, 2019, allowing a full twelve months for reporting delays. The Division of HIV/AIDS Prevention and Control collaborates with Alabama's medical providers to reduce the incidence of perinatal HIV infection. Visit HIV and Pregnancy for more information. Physicians, dentists, nurses, medical examiners, hospital administrators, nursing home administrators, lab directors, school principals, and day care directors are responsible for reporting Notifiable Diseases in Alabama. The Alabama Notifiable Diseases Rules, Chapter 420-4-1, specifies the diseases and conditions requiring notification, and the time frame and methods for notification. To report a case of HIV (including symptomatic infection, AIDS, CD4 counts and viral load), please use the Communicable Disease REPORT Card.